Very young children have an expectation that all good things will come their way. It is a pretty good place to be. Gratitude, however, means taking a step back from this space and looking at what has come our way, sifting through it and feeling love for those good things. It isn’t very easy to cultivate this kind of soul mood with very young children. You can’t sit down with them and say “Now, what are you grateful for?” I am not sure that gratitude is something that very young children experience on a conscious level, although it may come out in a physical way – expressions of joy, cuddles, caring play and precious out-of-the-blue remarks that make your heart sing. I think it is a pretty important skill to learn, and one that we can teach through imitation – that is by demonstrating gratitude in our everyday living. – talking about our day in terms of what we experienced, what we enjoyed and what we learned. 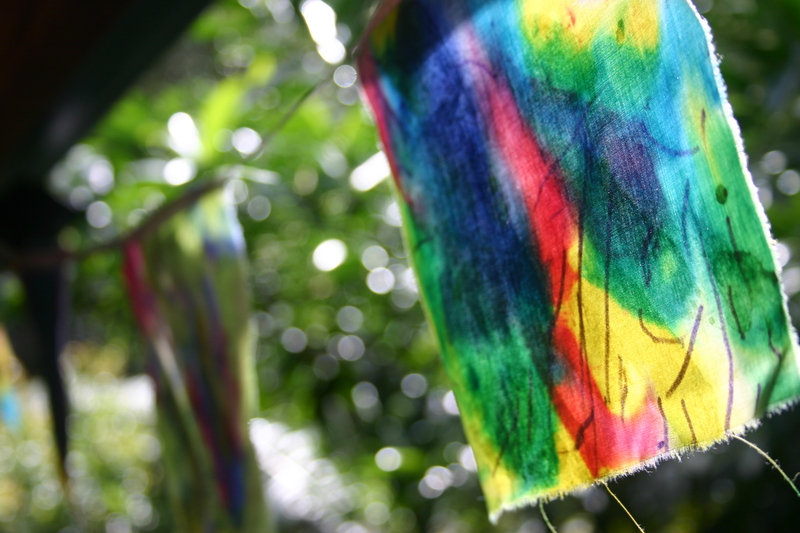 For playgroup this week we made prayer flags – little colourful reminders of happiness and thanks to flutter in our windows. 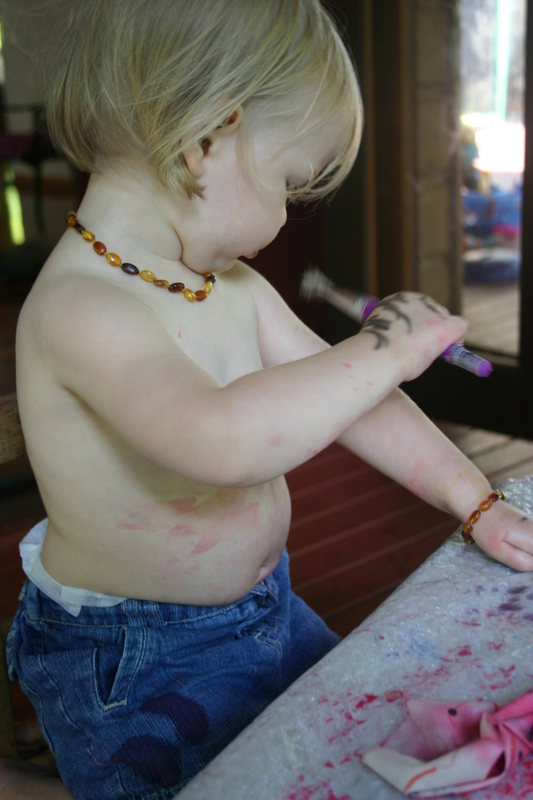 To be honest painting with children is not one of my favourite experiences – I have troubles getting over the inevitable spills of colour and the need to clean up afterwards. But it is so worth the preparation and the patience. My son is a bit older and he caught the idea of the exercise quickly. Here he is grateful for his strength, which he used to create a straw bale cubby in our yard. This cubby has brought many hours of joyful playing and constructing. 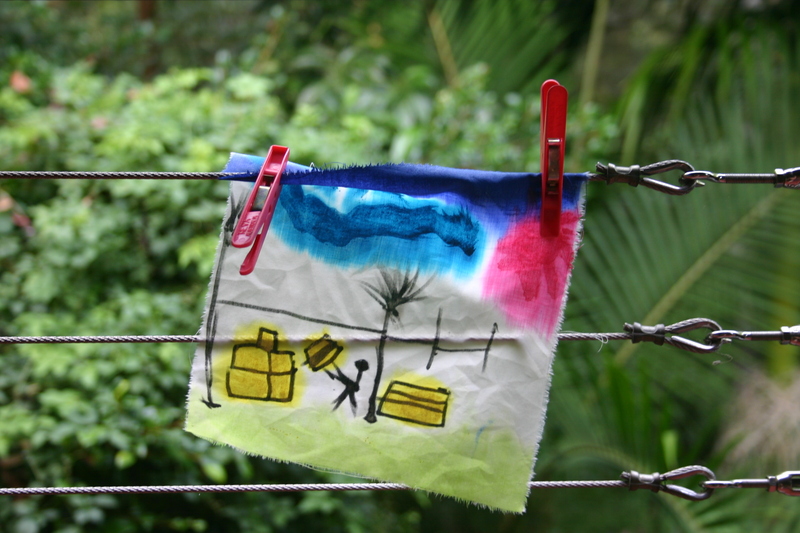 We made them with an old bed sheet ripped into squares, felt pens and watered-down fabric paints. Hung to dry and stitched on to a ribbon. What are you grateful for? Thank you Jen. I just bought tibetan prayer flags, they just arrived this week and i immediately gave them away to a good friend. 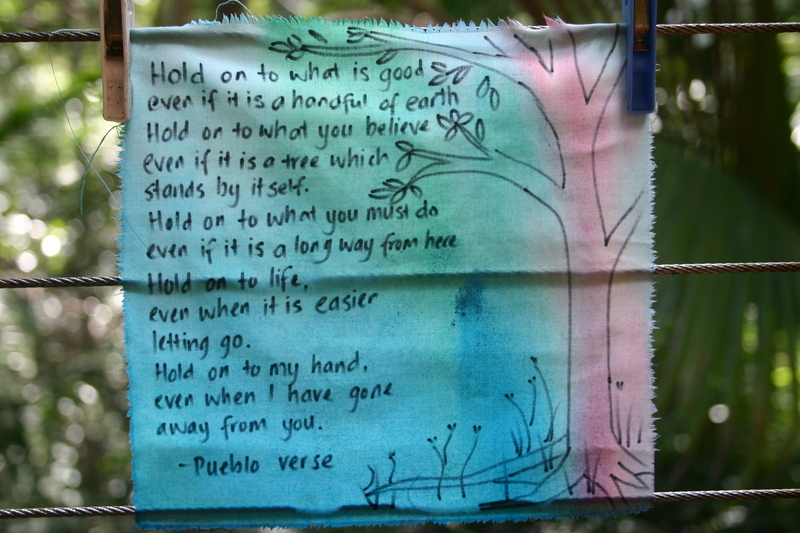 Your gratitude prayer flags are are exactly what I wanted without even realising. 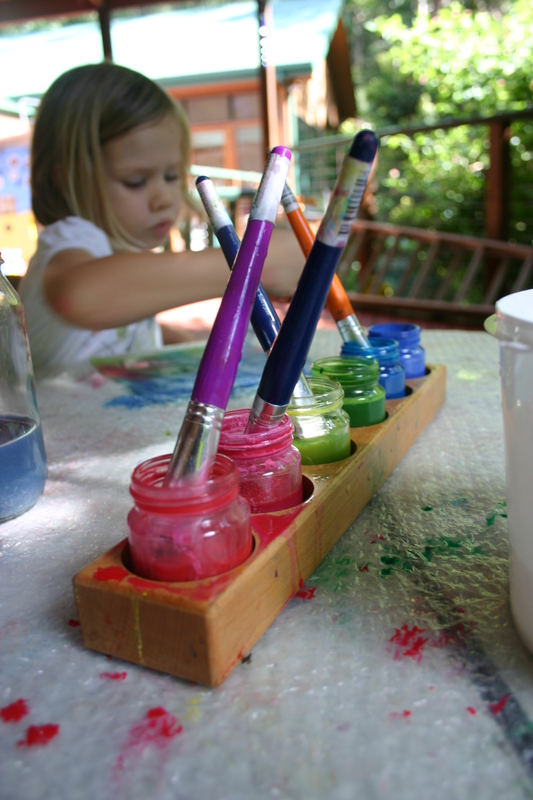 I can not wait to begin creating some flags with my children. Your flags are simply lovely. 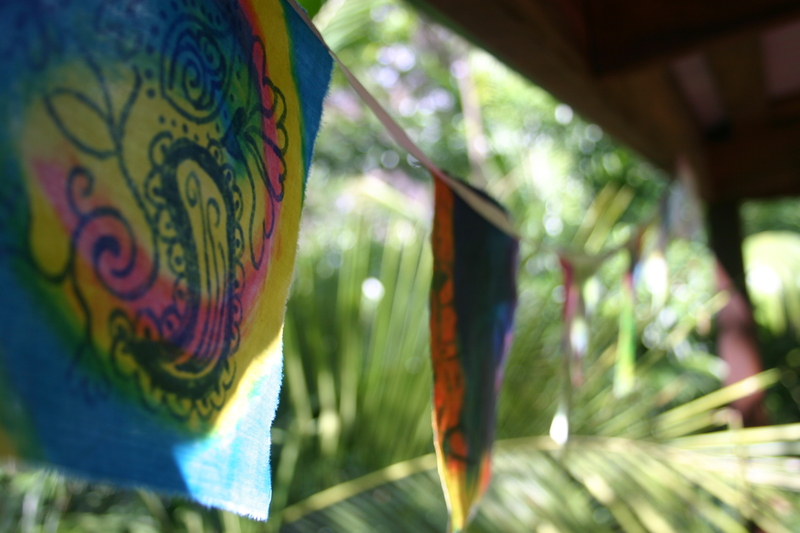 Love the creative artwork and your intention… to have colourful reminders of happiness. 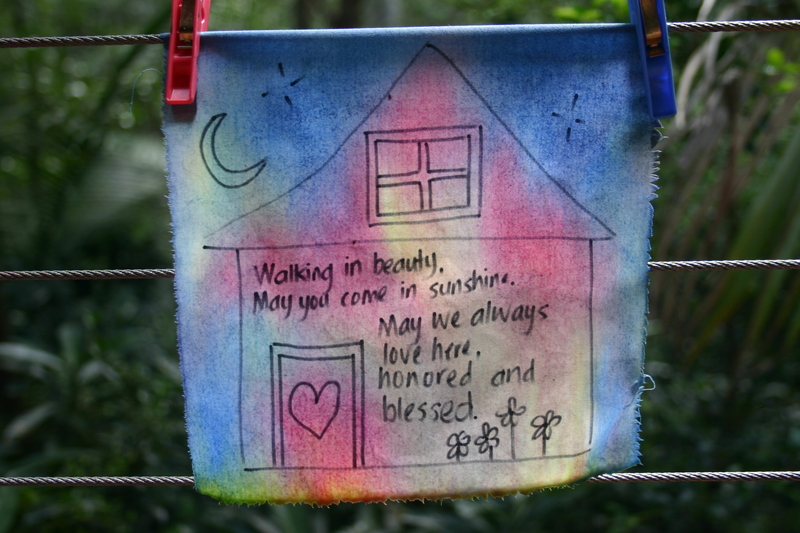 How clever to make Tibetan gratitude prayer flags. They were wonderful to make and many of the playgroup families have added to theirs (we only made four squares at playgroup) and have strung them up at home. I’m pleased to hear that other playgroups have given it a go too. It was a beautiful exercise in peace and gratitude to experience with my own children.